There are a number of wearable devices for charging things like cell phones and other small, mobile electronics so that you’re never in danger of being without a charge. Some of them run on solar power, while other designs gain their energy through movement or body heat. While they’re all ingenious inventions that deserve more interest and use, the fact is not everyone has “gone green” enough to actually invest in them. No, they’re not a passing fad and, yes, they work. But, in a lot of cases, they just haven’t received the kind of advertising or marketing strategy they need to get off the ground and really catch on. It’s for that reason that charging kiosks have really caught on in places like airports and malls. But what if you’re not at an airport or in the mall? Or, better yet, what if you live in or are visiting a remote or rural area of the world where stable electrical supplies aren’t stable at all? Believe it or not, there are more places like that on the planet than not. Here in the United States and in other industrialized nations, we take our power grids for granted. That’s not the case for much of the world, though. To people in less populated areas, where reliable energy sources can be far and few between, charging isn’t a snap. It’s in these environments that alternative energy is not only sought after, but actually thrives. In Rwanda, Africa, an organization called African Renewable Energy Distributor is behind an invention known as a Mobile Solar Cell Phone Charger (MSCC). 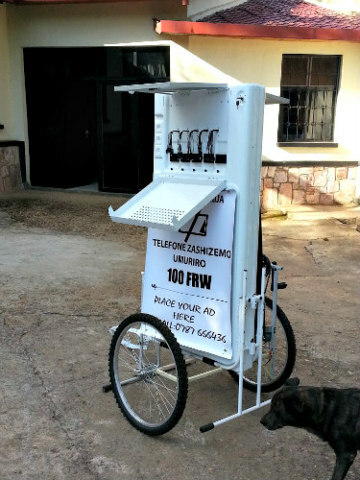 The lightweight charging station can be hooked up behind a bicycle or moped to deliver charging opportunities to residents of remote places. That’s because while electricity might not be so easy to come by, cell phones are. People now use cell phones in the farthest flung reaches of the universe. They may not have indoor plumbing, electricity or gas, but they’ve got a cell phone. Across the globe, from yak herders in the Himalayas, to Bedouins wandering the Arabian Desert and aboriginal populations all the way from South America to the Australian Outback and beyond, it seems everybody’s got a cell phone. Using renewable energy technology, the Quick Charge, as the unit is referred to, features two retractable solar panels containing 40 watts each at the top and a lithium battery in order to store electricity for night charging. A manual charging mechanism can be used when the device is in a stationary position or in the case of prolonged cloud coverage or rain. But with advances in solar technology, even inclement weather doesn’t render newer solar devices completely useless. 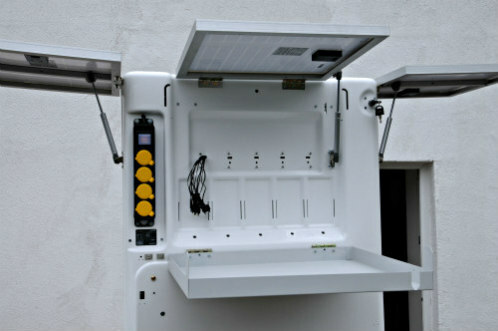 The clever design also features a locking system to keep the charging station and the solar panels secured at night. It even has a space on the unit for advertising, for local vendors looking for exposure. Since the entire Quick Charge system is on wheels, it can go wherever the customers are, such as local gathering places like open-air markets, churches and bus stops. This saves hours of walking or riding an animal, bicycle or moped to the nearest town or big city. Once people arrive there, they’ve still got to find a facility for charging. These units can be parked on the street, offering affordable options to traditional power sources where they’d undoubtedly pay more. Other industrious parties with the capital could deploy them in a franchise operation, creating further income opportunities for enterprising individuals or groups living in these remote areas. In 2013, the prototype was the winner of the Empowering People Award. For more information about this invention, interested readers can contact Henri Nyakarundi at info@a-r-e-d.com. YWI: Henri Nyakarundi, ARED from Young World Inventors on Vimeo.